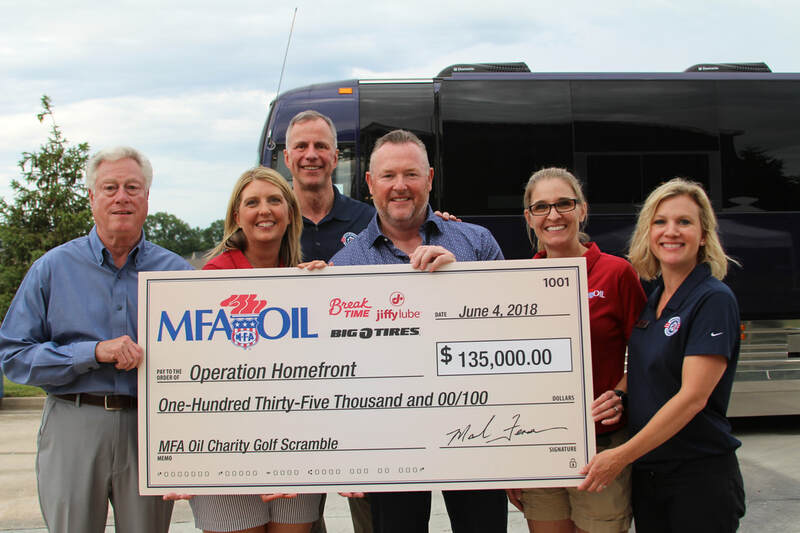 The Fourth Annual MFA Oil Charity Golf Scramble and Concert raised $135,000 for Operation Homefront, a national nonprofit organization that provides emergency and financial assistance to the families of U.S. military service members and veterans. The event was held June 4 at The Club at Old Hawthorne in Columbia and featured 58 teams and a private concert by country music singer Luke Combs. The money donated by MFA Oil will go to active duty military and veteran families in Missouri and Kansas, and surrounding areas. Founded in 2002, Operation Homefront provides military and veteran families with relief through critical financial assistance, transitional housing programs, resiliency through permanent housing and caregiver support services, and recurring family support programs and services throughout the year that help military families overcome the short-term bumps in the road so they don’t become long-term chronic problems. A special thanks to our sponsors for contributing to the fundraising effort, including: concert sponsor Warren Distribution; platinum sponsor CHS; silver sponsors Growmark, Innospec, Lockton Companies and Clear Vision Development Group; bronze sponsors Commerce Bank, Crockett Engineering, Joe Machens Dealerships, Little Dixie Construction, McLane Company, MFA Incorporated, Pepsi, Sinclair Oil, Smith Lewis LLP, Valero Energy Corp. and WESROC; dinner sponsor CoBank; and tee gift sponsor Williams Keepers LLC. Pictured L to R: John Laws, Operation Homefront Advisory Board Chairman; Jennifer Bach, Break Time Director of Marketing/Merchandising; John Pray, Operation Homefront CEO; Mark Fenner, MFA Oil CEO; Ashley Bower, MFA Oil Sr. Marketing Manager; and Kristin Castle, Operation Homefront Director of Programs.